For as long as I can remember I've only ever had one really close friend at a time. I've never been one to have a bunch of friends that I hang out with. I think the biggest group I ever hung out with was when I was in high school. Even then I was only close to one or two of them at a time. I can even name each one of my best friends from kindergarten on. Stephanie (kindergarten), Desiree (1st), Natsha and Connie (2nd), Amy (3rd and 4th), Melissa (5th), Anisa (6th and 7th), Teresa (8th, 9th), Alyssa and Jessica (10th, 11th), Melissa, Michelle, Kelly, Cynthia, (11th and 12th).... I stayed good friends with Melissa right after high school. 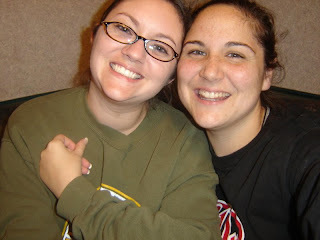 Soon after her and I stopped talking I met Lizz.... We've been best friends ever since. We've been there for each other through pregnancies, our husband's deployments, my first marriage, our kid's firsts, my divorce and me getting remarried. When she first left I didn't really have TIME to miss them. Josh and I had just gotten married and moved into our new apartment. Then we went on our road trip to El Paso. Next we got our dog, Bella, we had Thanksgiving and we started getting ready for the holidays. I'm still busy with holiday stuff, but we've been able to slow down just a little and finally got into a normal routine here at home. Now that I have a moment to think about things, I really miss her! I miss us spending the day together with our kids while our husband's were at work. I miss us all hanging out on the weekends... having BBQs or pizza together. I miss my shopping buddy, my listening ear, my friend. Of course I do have Josh. He really is my best friend and I love spending time with him. He's a man though. I can't talk to him about stuff without him trying to fix things... I don't want things to be fixed, I just want to talk. I usually have to explain that to him if I've had a difficult day and I just want him to listen. He doesn't mind... But I miss having that girlfriend there to talk to! Ugh.. then there's shopping. Josh likes tolerates shopping with me. He likes to get in and get out. I like to look around. Even if I know that I'm not gonna buy anything else I still like to look. I do still have a few friends around. I grew up here after all and I do know people... but I'm not close to any of them. We'll talk once and while. Hang out every now and then. It's just not the same as having that one best friend who you know you can tell anything to and she'll probably have a similar story of her own... then you can both sit there and laugh about it til you cry. Makes me wish we were in Missouri already so her, I and the kids can all hang out again. I'm missing out on so much already! Her youngest is already talking. I'm sure her oldest is doing all kinds of new stuff too. I know Camron misses his best friend too. Aww, that's totally understandable!! Hopefully this next year flies by and you two will be back together again! I just moved away from my bff and it's so hard! One of the biggest reasons my last relationship didn't work out was because he was constantly offended when I didn't want advice. He wanted to fix things for me and never understood why I sometimes just needed to talk it out. I don't see my BFF very often, even though we work at the same college and are on a committee together! I miss her.